There are just four episodes left in Season 6 of HBO's Game of Thrones, which continues in a few short days with The Broken Man, airing Sunday, June 5 at 9 PM ET. Following the brief preview that debuted after Sunday night's episode Blood of My Blood, the network has released six new photos, which reveal two reunions and the return of Brynden "Blackfish" Tully (Clive Russell), who hasn't been seen since Season 3. Naturally, if you haven't watched last week's episode, Blood of My Blood, there will be plenty of SPOILERS below, so read on at your own risk. Perhaps the most interesting photo in this gallery shows Sansa Stark (Sophie Turner), Jon Snow (Kit Harington) and Davos Seaworth (Liam Cunningham) meeting with an unknown character. We saw in the preview that Sansa is meeting with a number of unspecified characters, who are most likely her family's northern allies. The trailer showed sigils for both the Mormont and Glover houses, so it seems that this trio are trying to build an army to take back Sansa and Jon's home of Winterfell from the nefarious Ramsay Bolton (Iwan Rheon). 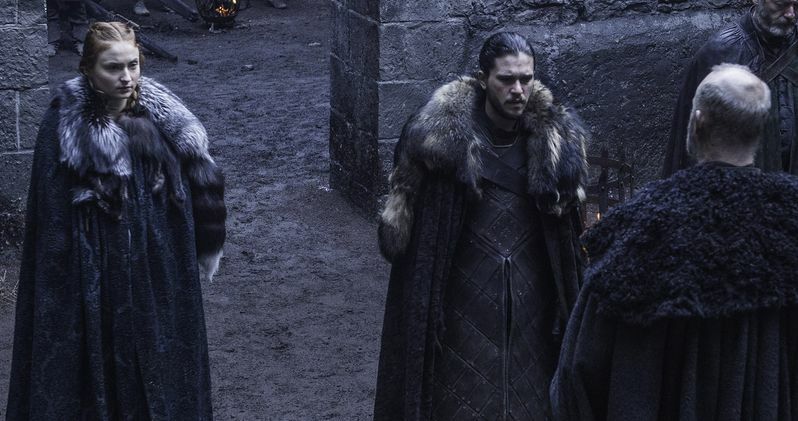 Last week's episode also marked the return of Walder Frey (David Braldey), who hasn't been seen since Season 3, when he orchestrated the infamous Red Wedding where Robb Stark and his mother Catelyn Stark were heinously murdered in cold blood. Walder Frey revealed in Blood of My Blood that Blackfish has taken back Riverrun from House Frey, and orders his men to take it back. After being stripped of his position as a member of the Kingsguard, Jaime Lannister (Nikolaj Coster-Waldau) was sent to deal with Blackfish, and we saw a glimpse of Jaime and Blackfish's encounter in the trailer. We get a better look at Blackfish in one of the new photos below, but we'll have to wait and see how his story develops. Jaime also mentioned in last week's episode that he plans to find Bronn (Jerome Flynn), give him the biggest bag of gold he's ever seen, and have him track down the best killers in Westeros to bring down the High Sparrow (Jonathan Pryce). One of these photos shows Jaime and Bronn, with a number of soldiers standing behind them. We're not sure if this is part of Jaime's meeting with Blackfish, or if it's part of his quest to take down the High Sparrow. It's possible that he could try to lure Blackfish to help him kill the High Sparrow, but we'll have to wait until Sunday night to find out for sure. The final photos reveal Olenna Tyrell (Dianna Rigg) reuniting with her granddaughter Margaery (Natalie Dormer), after she was released from captivity. We also see Cersei (Lena Headey) meeting with Olenna, who said in the trailer that both the Tyrell and Lannister houses are facing collapse after Cersei's "stupidity." The final photo showcases Arya (Maisie Williams) eyeing something, with the massive statue at Braavos' port seen in the background. Take a look at these photos courtesy of HBO, and stay tuned for more on this week's episode of Game of Thrones.